Home » Legal Sports Betting » DraftKings Sportsbook vs. FanDuel Sportsbook: Which Sports Betting App Is Better? DraftKings Sportsbook vs. FanDuel Sportsbook: Which Sports Betting App Is Better? After two months of legal sports betting in New Jersey, it’s clear that DraftKings Sportsbook and FanDuel Sportsbook are the two runaway leaders in online betting. We felt it would be worth putting them in a head-to-head showdown to determine which is the better option for you. We have done lengthy reviews of each, so the goal of this post will be to compare them in different areas in order to help you determine which to use. The way I see it, there are six categories in which it makes sense to judge a sportsbook: interface, odds, bonuses, deposit methods, stability, and the variety of action offered. Both DraftKings Sportsbook and FanDuel Sportsbook are available on iOS and Android and through web-based interfaces in New Jersey. So App Store availability isn’t a factor. Before we get started, full disclosure: we are an affiliate of both sites, which means we may get a small referral fee if you click our links and eventually sign up for either site. So we have no horse in this race. Both are great options which we’d recommend, but there are differences. DraftKings goes with a dark backdrop with green font to match its general brand aesthetic. This actually fits quite well with the general trend of “dark mode” enabled apps on iOS products, so credit for the foresight to embrace the look. But want really matters is ease of use and how clear call-to-actions are. Bet options are clearly marked and provide large-square touch targets. A small slider window appears and allows you to lock-in your bet right from the current screen. 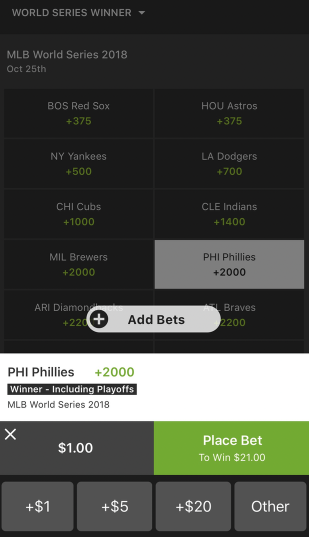 DraftKings Sportsbook features a home screen that calls out popular bets and personalized recommendations based on teams you are interested in. DraftKings also says their app will present action related to your daily fantasy plays, which is a cool touch. But we wish they would make it easier to quickly identify leagues and sports. Generally, when you go to place a bet, it’s not a purely impulse buy– you likely thought about something and opened the app with the intention of wagering on a specific game or looking for its odds. If this just happens to be one of the options presented to you, great. But if not, it’s not immediately intuitive on how to get there. Personally, I hate “sliders” in apps– especially ones that rotate based on what an app thinks you want, or based on some other sort of algorithm. I like the consistency of options remaining the same every time you open an app, which allows muscle memory to take you through the app without thinking. DraftKings, however, uses “quick links” to navigate leagues. And while generally the major options are always there – NFL, NBA, MLB – the order changes. For instance, right now, Champions League is listed first, but over the summer, MLB was listed first. I respect DraftKings’ efforts to surface the most relevant sports, but keeping static links to the most popular leagues would just make more sense. Ditto for how they handle game- and sport-based sections. The use of sliders or tabs is prevalent, rather than just having all the information on one screen. By the time you get the wager option, you might be three levels deep: sport-type of bet-individual option. It seems DraftKings’ layout is more type focused than sport or game focused. FanDuel features more of the available options for one game on a single screen. Even SugarHouse Sportsbook, which also uses Kambi to set its lines, does this better. Placing a bet in DraftKings is super easy, however, and your bet ticket simply slides up to enter your amount and confirm the bet. The “cash out” option is also super easy to use and adds a fun wrinkle to betting. Live betting options also get their own tab at the bottom, and we think it’s deserving of that real estate, but we wish DraftKings did a better job of showing live scores, information which is critical for real-time betting options. Overall, it’s a decent app but with an unnecessary layer of complexity. FanDuel’s app is beautiful. There, I said. 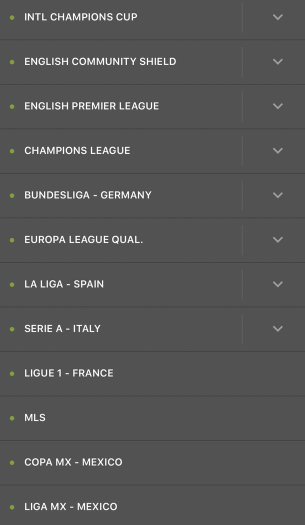 This is how a mobile sportsbook should look. There are virtually no vestiges of the sometimes-crummy looking casino vibe, and rather FanDuel looks like it could be anything from a sportsbook, to a cooking app, to a ride-sharing service. That’s a good thing. It belongs on both iOS or Android, and the web-based interface FanDuel offers is just as good. That’s not to say the app is perfect. But the issues seem to be more minor update or coat-of-paint type things. From the home screen, betting options are clearly marked, and there are tabs for “popular,” “live,” and “upcoming.” It is easy to find the game you want, and all of the available action is readily available. The bet ticket itself, while complex, make sense. Adding multiple games give you options for parlays and teasers. My two small nitpicks are the way FanDuel handles the notch area on iPhones (update this, please) and how your bet ticket is often hidden in a tab after you select more than one game. I usually expect it to pop up when I select a wager so I can lock-in action, but it only does this for the first item you put into your ticket. Not a huge deal, but it forces you to take a beat to make sure you actually selected something. FanDuel’s app looks great and doesn’t try to do too much. I just wish they would fix some of the odd spacing quirks on iOS. Ohhhhh boy, we could turn this into a whole thing, noting the various gripes that surrounded each sportsbook at launch, but those were largely unfounded. What most people have to realize is that the new legal online sportsbooks have taxes and regulations to consider, meaning there will be some added cost compared to offshore sportsbooks or you local bookie. To be clear, DraftKings Sportsbook and FanDuel Sportsbook do offer different pricing and odds, but it’s hard to say one is better than the other. DraftKings uses the popular sportsbook provider Kambi to powers its app, meaning they share the same lines as SugarHouse and 888sport. We’re told they plan to eventually set their own market, but right now they are using a third-party provider that sets the market for two other sportsbooks. FanDuel offers different lines. I tend to be less concerned with the price of bets than I am with the line being offered. Depending on which side you fall on, this could be good or bad, but generally I find FanDuel to diverge from the crowd and offer more unique value when you’re looking for it. Overall, however, both apps offer competitive lines that just happen to be different. There are two ways to judge sportsbooks on bonuses and promos: One is to consider the initial signup deposit bonus or promo that’s offered, and the other is to consider what they offer on an ongoing basis. On the former, DraftKings gets the edge. They offer up to a $200 match on your first bet and soon will offer a $20 free bet upon registration with no deposit. That gives you a great way to test out the app before you ever enter your credit card. They have been a little slower on weekly offers, though we are aware of some excellent local odds boosts they plan to offer soon, so I think they will begin getting more aggressive in this regard. FanDuel’s initial signup bonus is the worst in the space– $100 deposit bonus. But they make up for it with a series of daily and weekly offers that provide you with some genuine value. They are big on “bet guarantees” that either cover losses or provide some sort of credit for a late blown lead. There are of course restrictions with these offers, and they can’t be stacked with other promos, but they are worth checking out and have their own tab in the app. This one is quantifiable. DraftKings doesn’t offer nearly as many options as FanDuel, and not even close to as many as competitors such as SugarHouse Sportsbook. DraftKings currently only accepts deposit through credit card (all major credit cards accepted), bank transfer, PayPal, and Skrill. FanDuel accepts credit card, FanDuel prepaid card, PayPal, eCheck, online bank transgfer, wire transfer, PayNearMe, and check. A big factor in determining which sportsbook to play, especially when you are live betting and need real-time access, is stability of an app or platform. To date, some of the apps from casinos, traditionally not technology companies who rely on third parties to build their platform, have been buggy at best and unusable at worst. This really isn’t an issue with either DraftKings or FanDuel. They are not perfect, however. Each has its own quirks (the FanDuel iPhone borders, for example), and the New Jersey DGE requires FREQUENT logins and location checks, which does disrupt the user experience. And in some cases, there have been issues with depositing, but this is not exclusive to DraftKings or FanDuel– banks and credit card companies have been reluctant to approve gambling-related transactions. But ultimately these are the two most reliable apps on the market. Both DraftKings and FanDuel are technology companies first, so we can recommend both. DraftKings Sportsbook currently uses data provider Kambi to set its markets, which means they actually offer the same action as SugarHouse Sportsbook and 888sport. They can request Kambi set unique lines for individual events at an added cost to them (DraftKings), but generally speaking, it’s the same book. As a result, DraftKings offers betting on virtually every sanctioned sporting event you can think of (not esports, yet). Both sites offer the range of bet types you would expect, including spread, moneyline, parlays, teasers, props and more, as well as alternate lines and cash out options. But Kambi does have a slightly more diverse – or, if you prefer, exotic – range of options. Each site offers its own strengths and weaknesses, and ultimately the choice will come down to what is more important to you. FanDuel Sportsbook has the better interface and more variety in weekly promos and offers. They also have slightly more deposit options. DraftKings Sportsbook is the most popular and offers slightly more variety in its action as well as a better registration and deposit bonus. Aren’t these only relevant for people living in New Jersey? Come to my new site “filthy Arab locks” for all my picks! Kyle- your posts are horrible. Yoou hazve ended my four day long hunt! God Bless you man. Have a great day.